With vacation rental property management companies on the rise (and let’s also acknowledge the fact that these entities are nothing new when it comes down to it), marketing yourself as a vacation rental manager and landing a management gig is tough. The competition is fiercer than ever. So if you want to jump into the property management pool, how do you get started? We won’t deny that it will be a bit of an uphill battle, but we’ve got a few tips to help you seal a deal (or a few!). 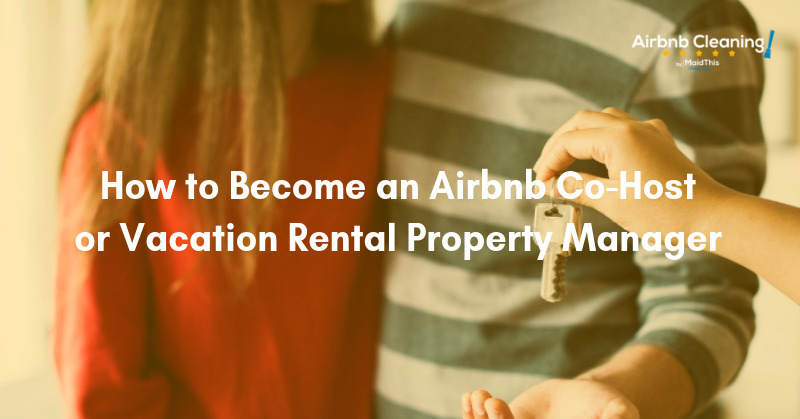 Perhaps one of the most head-scratching roadblocks when it comes to getting started in vacation rental management is knowing where to track down hosts and owners who are looking for management (or as Airbnb refers to it, “co-hosting”) help. You can’t just go knocking on doors, can you? Not exactly. But you can use some of the tools already at your disposal. If you’re already an entrepreneur of sorts like our friend Davida Horn, who started her management gigs via her relationship as a bookkeeper for her clients, use that “in.” If you’re already offering a service and happen to know or work with vacation rental hosts, talk to them about the possibility of helping them manage their property. 2. Become a really good local guest. This is just smart all the way around: Being a great guest means you probably also know what a great host is like. But use your local vacation rental stays to your advantage – use this as a way to meet and get to know other local hosts in your area. Sure, you have to pay to stay, but you’re also building relationships. If the host you’re staying with isn’t interested in getting management or co-hosting help, perhaps they know someone that is. Put simply: It pays to know people and the more people you know, the more you could potentially get paid. There’s a possibility that you could find someone asking about where to find a vacation rental manager on a number of job boards and, more importantly, this may also be a good place for you to list your own availability. You can also look on industry-specific websites like Airhosta. Airhosta matches potential co-hosts and property managers with hosts looking for help with their listing. Check it out! Now that you know where to search, who to talk to, and what to look for, the next step is ensuring that once you start exploring those avenues, you look the part and have a stellar sales pitch. Don’t forget you’re selling your skills as a co-host or vacation rental manager! Your professionalism and preparedness matter. 1. Organize a management proposal to show off your expertise. Ideally, you should have some experience as a host yourself so you can prove once and for all that you know your “stuff” and can handle helping your potential clients’ guests and running the show from the backend. We’re just scratching the surface here – overprepare so you can show yourself at your best. 2. Focus on what sets you apart. As we said before, vacation rental management is nothing new and it seems like everyone is getting into the business these days. What do you have that makes you different – or arguably better – than the other individuals and companies you’re competing against? Don’t be afraid to be confident about what you can offer. That’s likely to be your biggest selling point. 3. Set a reasonable (but competitive) rate for your services. Typically, vacation rental managers and co-hosts take a percentage cut of the rental rate secured by the actual host. A number of sources online suggest anywhere from 10-25%. Setting your own rate can be a little tricky because you don’t want to undersell yourself, but you certainly don’t want to oversell, either. Look at your experience and what unique points you can offer, and set a rate for yourself. Consider developing a tiered option, too, to give your host more flexibility. If guests stay longer, perhaps your percentage cut could be a bit lower. In the end, you have to do what’s best for you and feel confident that you’re getting back what your services are worth. It’s no cakewalk getting started as a vacation rental manager or co-host, but the payoff is often well worth the legwork. If entrepreneurship is something you’re striving for and you’re passionate about hosting guests and visitors to your city, this may be a great “job” for you. So what are you waiting for? Get started! Need help deciding how to show your potential hosting clients how you’ll handle turnover cleanings? Let MaidThis! help! We provide Airbnb and vacation turnover cleanings to dozens of hosts and have an exclusive team of cleaners whose sole responsibility is turning over vacation rentals. Give us a shout for more information.